In the decade that Ricketts published his studies The Prado and its Masterpieces (1903), Titian (1910) and Pages on Art (1913), it was not yet customary to include a list of references or footnotes to disclose one's sources. Quotations were not easy to verify. Ricketts's Titian does not include a bibliography. In France, the notion that an art-historical study ranks as 'belles-lettres' lived longer than in England. The same goes for a biography, which could apparently do without footnotes, references, or an index, without being seen as a fictionalized life (vie romancée). 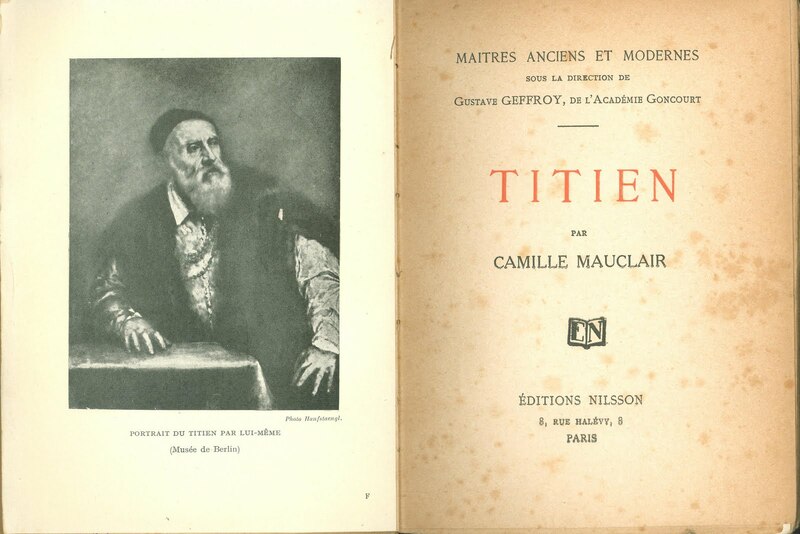 Camille Mauclair (born as Séverin Faust, 1872-1945) wrote a book about Titian as well: Titien (Paris, Éditions Nilsson, 1925). Mauclair initially was a poet and, in 1898, he wrote a novel, Le Soleil des Morts, portraying several important fin-de-siècle artists. 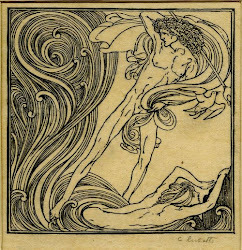 Camille Mauclair went on to write biographies and travel books. 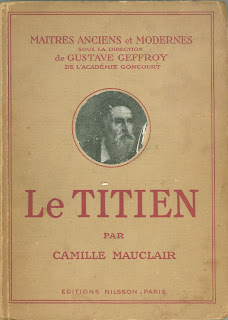 His book about Titian appeared in a series of 'Maîtres anciens et modernes' (Old and Modern Masters) and there are no footnotes or references. In a 'Note' at the end, however, he writes: 'Les références sont multiples' and he only mentions two authors whose books were easy to come by, one by Maurice Hamel and one by Henry Caro-Delvaille. 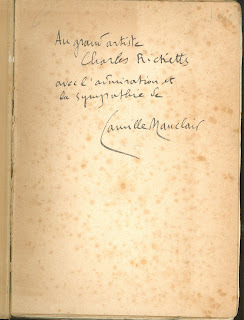 Camille Mauclair knew about Ricketts's study, though, and he sent a copy of his own book to the British connoisseur. The book is printed on paper that is not destined for eternity and the pages show the marks of its ageing process. 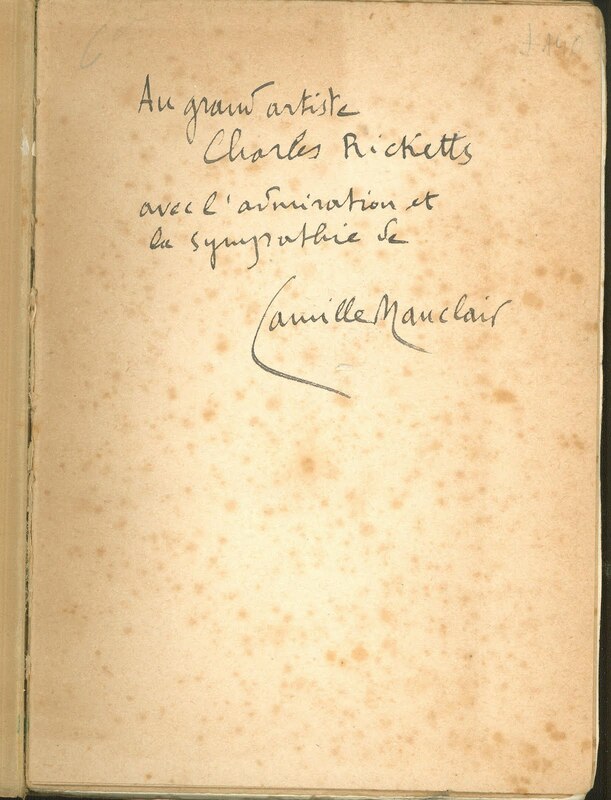 In Ricketts's copy the author of Titien (or Le Titien, as the cover has it) has written an autograph dedication: 'Au grand artiste Charles Ricketts avec l'admiration et la sympathie de Camille Mauclair'. 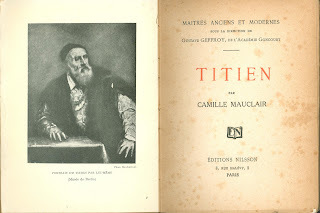 Did Mauclair use Ricketts's book on Titian? 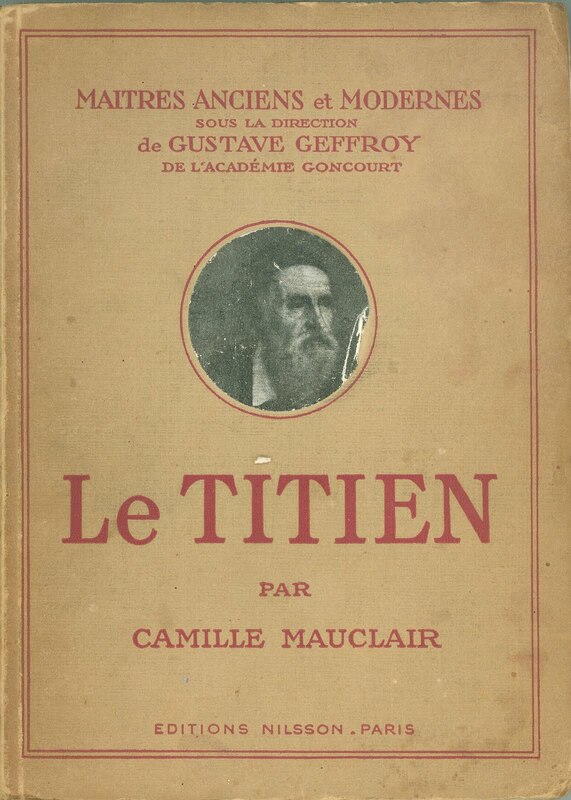 Has Ricketts read Mauclair's biography? The dedication copy of this book was recently sold at auction and acquired by a private collector.